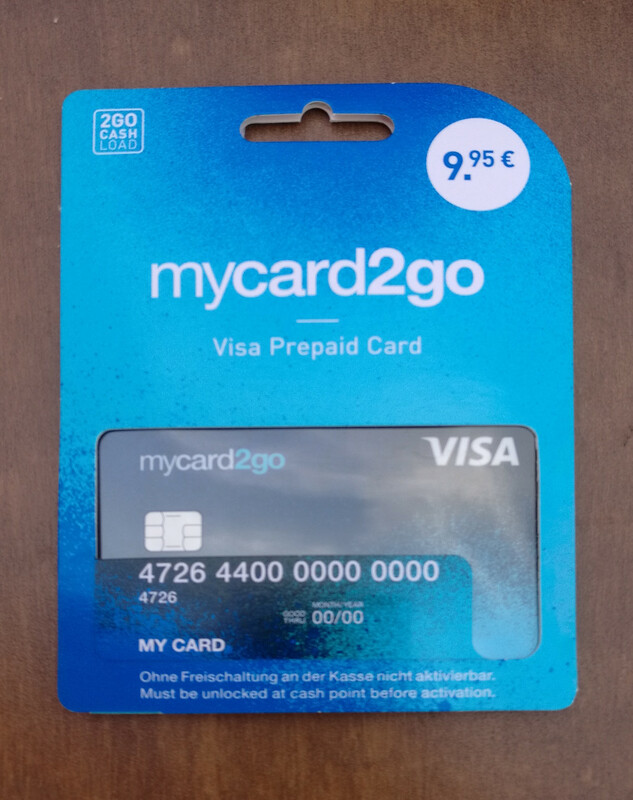 After using the mycard2go for almost two weeks now, I can give you some additional information on top of what the official website tells you. Please do not hesitate to ask any further questions that you might have in the comments section. Purchasing this card was harder than I thought. However, once I found a shop able to sell me this card, the process was quick and painless. 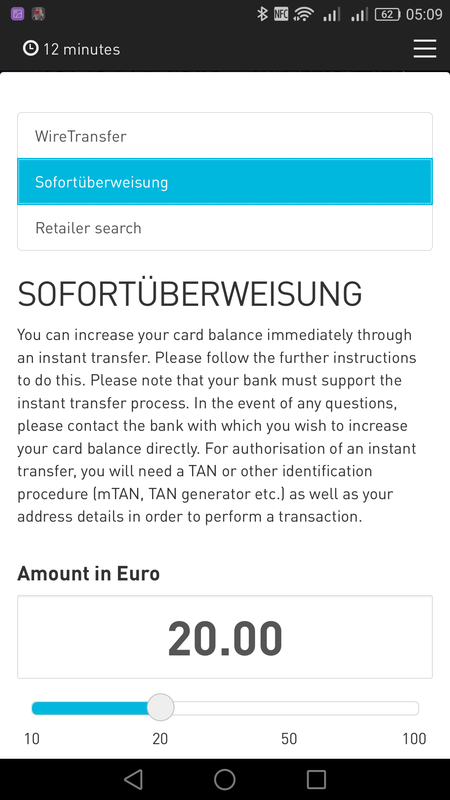 When you buy the card, you can instantly top it up without extra charge up to a total of 100 EUR. After purchasing, the card has to be activated by sending a text message to a special number. You will get an automatic reply within a couple of seconds, confirming activation and telling you the PIN. Further you will receive a password which you can use to access the web-interface. For full fee structure and limits, please read the summary of fees and limits. The card has no imprint, the card number is just printed flat on the card. For that reason, using the card with an imprinter is not possible. Since you buy the physical card (instead of ordering it), it also comes without your name, instead it says MY CARD. This can be to your advantage if you want to use the card in a context, where you don’t want the merchant to know your name. If you want to use the card for more than the initial top-up, you will have to upgrade it, providing your personal details and completing a PostIdent verification. Upgrading the card is free. Luckily, Deutsche Post has expanded its service and now provides a video call based identification method. You have to have your Passport ready and can identify yourself via your webcam or Android/iOS device. The whole process takes less than 10 minutes. Unfortunately, your mycard2go will not be upgraded immediately. 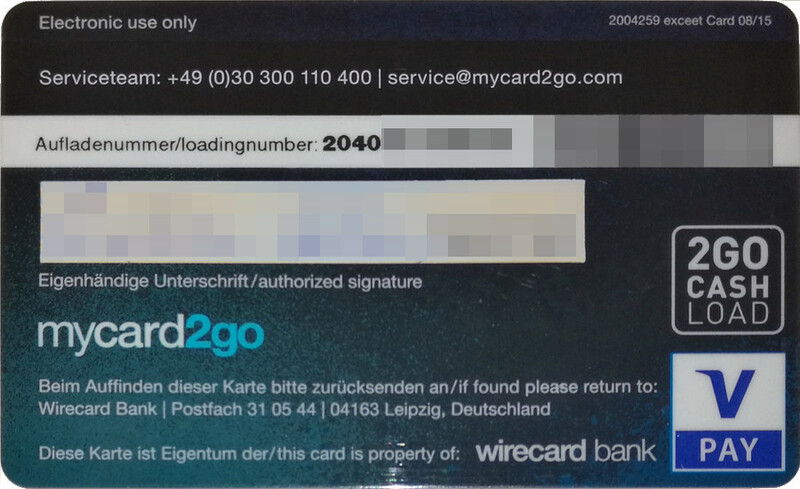 The process between Deutsche Post and mycard2go is not automatic, so someone at mycard2go has to manually handle your request. The processing, according to telephone support, is meant to take three days—but even after seven days, my account was not upgraded. It took me twelve days and a couple of support calls and emails to get my card upgraded. This left me vastly unsatisfied. You can top up using cash at many gas stations and other location (use the store locator). At 4% (at least 1.00 EUR) this is the most expensive way to top up. However, it being instant, some customers might have good use for it. Contrary to cash, this is the slowest, but cheapest way to get your money into the card’s account. At only 1.00 EUR flat you can deposit up to 5000 EUR at a time, bringing down the cost to 0.02% in the best case. It will take up to three days for your funds to arrive. 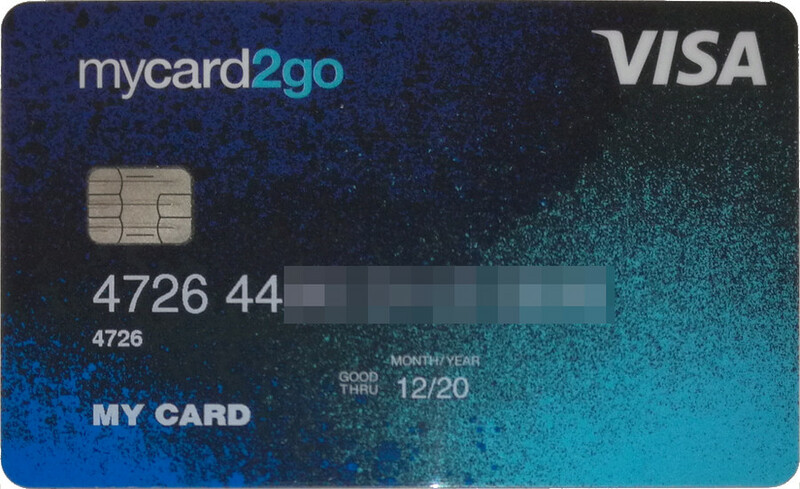 This does not really get money into mycard2go, but moves it between accounts. 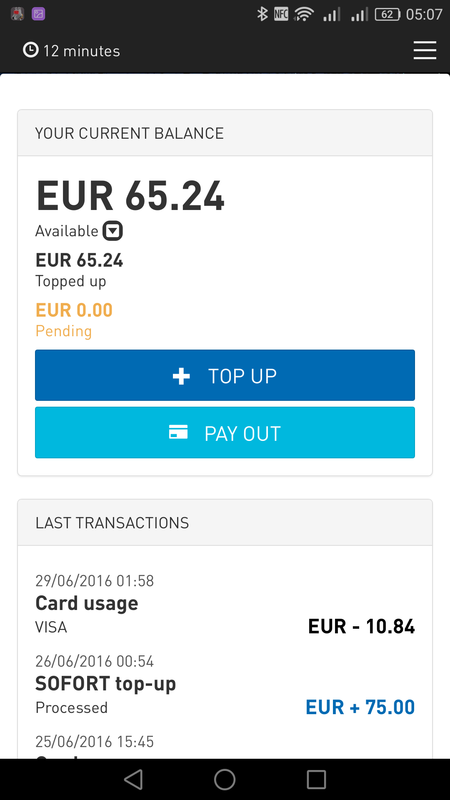 As fully identified user you can send up to 50.00 EUR at a price of 0.15 EUR. This might be handy if you are topping up your own card and then distributing small amounts to—let’s say—your kids. This card has two applications, namely VISA debit and VPAY. This means, that whenever you are paying at a shop that supports both payment providers, you might be prompted with a dialog that asks you to select either one. Some terminals might have a default which they use or not support application selection. In this case, you will immediately be asked for the pin to authorize the transaction. I hope I will be able to provide a photo of that process soon. It works like any other VISA. Just enter the credit card number, expiration date and security code from the back of the card to buy goods and services online. 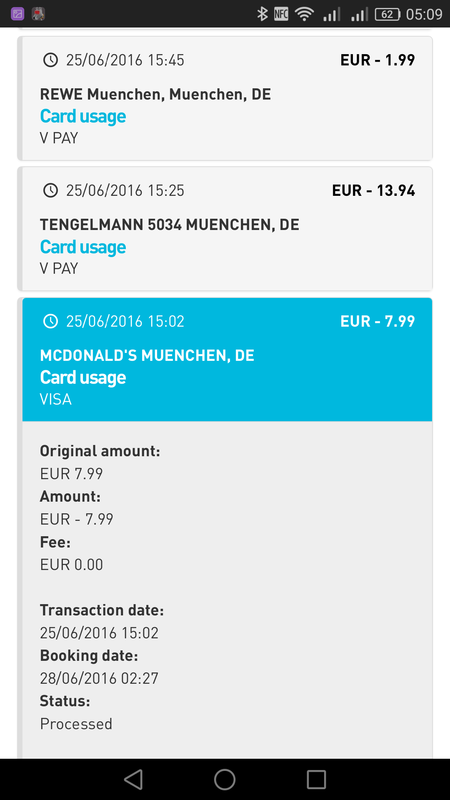 The banking interface located at https://login.mycard2go.com/df/ features two languages, German and English. It uses a responsive design, so it looks and feels great on the desktop and on the phone. Using the mycard2go for foreign currencies is very attractive, since there is no extra charge for that. 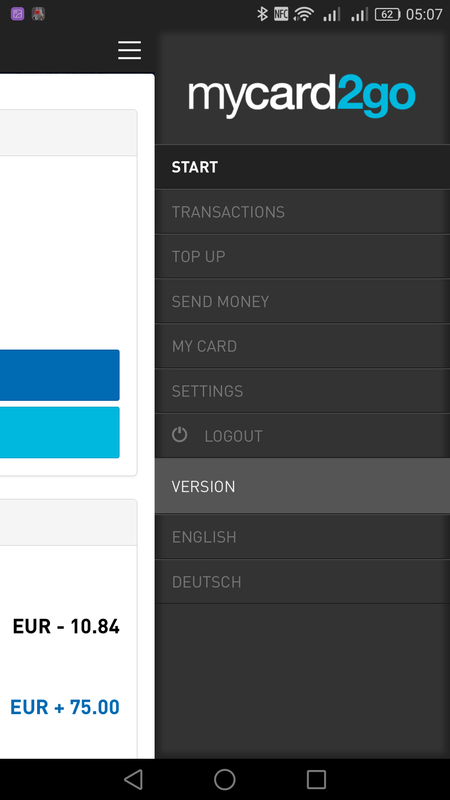 However, Wirecard is setting their own exchange rates, so this is kind of a black box right now, because unlike VISA, exchange rates are not public. I only had one foreign currency transaction of 12 USD so far which I’d like to share with you. When I originally made the purchase, the transaction was shown as pending with an estimated exchange rate of 1 EUR = 1.0969 USD–amounting to 10.94 EUR. This rate is the same as the official VISA Europe exchange rate. It is not yet clear if that was a coincidence, or if VISA Europe conversion rates are being used for pre-authorizations. A few days later, when the transaction cleared, the final amount changed to 10.84 EUR, which—according to the account details—is a result of the exchange rate of 1 EUR = 1.11 USD. 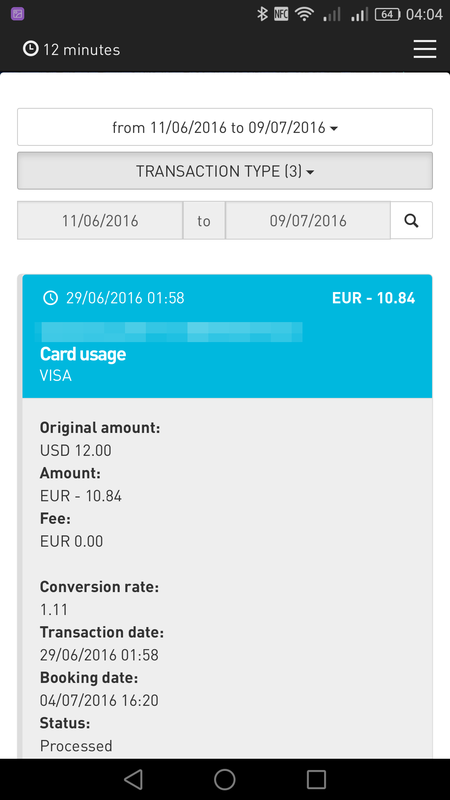 It is worth pointing out, that for this booking date, VISA Europe listed a slightly disadvantageous conversion rate of 1 EUR = 1.1022 USD. According to the support contact I had, the rules for exchange rates are as follows: The exchange rate is the same exchange rate as the ECB publishes. And just like the ECB rate, it is valid until 2:15pm the next day. The significant date is the transaction date, not the booking date. This makes the card a very potent tool for your foreign currency transactions. Support is available in German and English. I contacted the customer service a couple of times. As it seems, the department handling card upgrades is very busy just before vacation season. This was the reason they told me why my card upgrade took longer than three days. A definite pro is, that you can call them until 1am at night – questions that can’t be answered right away will be forwarded to the second level. They usually respond within one day via email. If you successfully completed PostIdent and your card hasn’t been upgraded within 5 days, I recommend just calling them during daytime and have them do it while you are on the phone. Putting the long wait for identification aside, I think this is a pretty decent card. With an annual price of only 10 EUR, it is among the cheaper ones you can get in Germany. Paying a buck for a top-up also isn’t the end of the world, especially when you deposit in bulk. 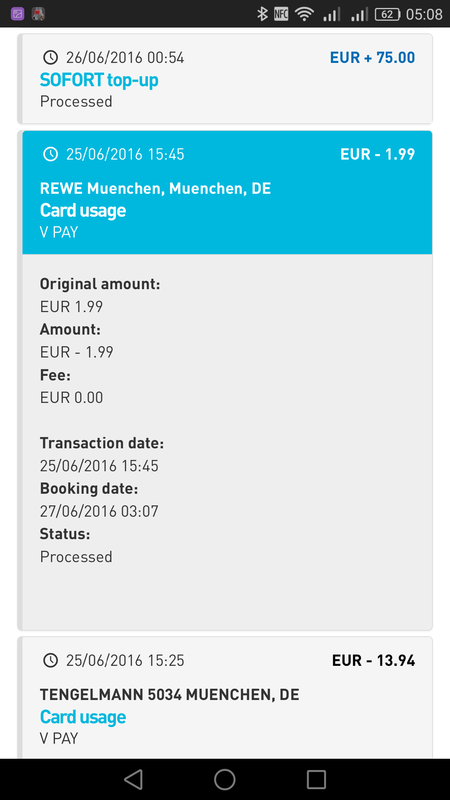 I transferred 1000 EUR to it, that’s an additional fee of 0.1%—as the mycard2go is my backup (and for when I need the extra bit of anonymity), I don’t think I will run through my balance fast. Of course you don’t want to use this card if you only plan to top it up 10 Euros at a time. Exchange rates set by: Wirecard Bank, set at 1:00pm every bank day. No public exchange rate lists. What about the V PAY application’s CVMs, does the V PAY application support offline pin? I have just upgraded my cardpeek and added the V PAY cvm list. Yes, offline pin is supported. Hi, is it possible to get swift transfer from USA in usd to this card in euro converted to euro? Sorry, I can’t answer that. You might want to ask support instead. when you upgrade your card to unlimited, did you make proof of address? or only identity identification? I think that my address was also verified. I don’t know what the upgrade process looks like if you are not in Germany. Thanks for the detailed information! 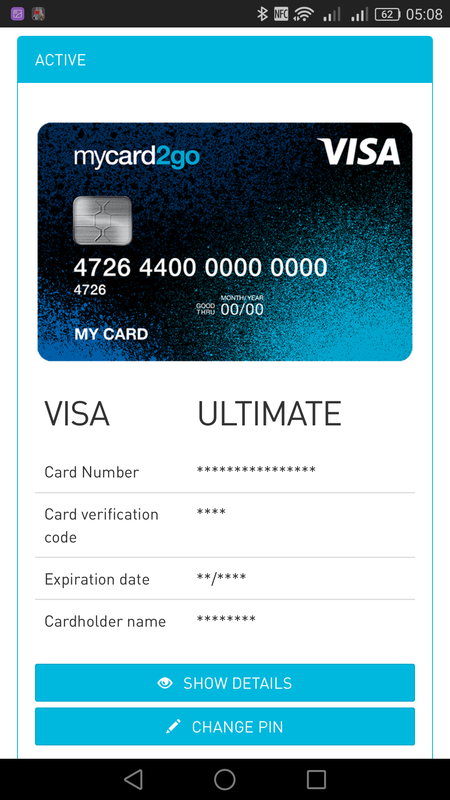 Does the card support the „Verified by Visa“ security mechanism? is it possible to fill the card with paypal? When you get the card, you have a bank account with your own IBAN, so if you have balance on your PayPal, you can withdraw / transfer to the IBAN on associated to your card. This only make sense if you use PayPal to receive from friends and you have a PayPal balance, if you want to top up from PayPal using your personal credit card then you will take lots of taxes. Yes, it is possible, but it will cost 50% of amount, you will load. Hi, im from Greece, can i purchase this card? if yes what ways can i top up my balance and in what ratio?